Michael Steven Bublé (/buːˈbleɪ/ boo-BLAY; born 9 September 1975) is a Canadian singer, songwriter, actor and record producer. He was recognized as an Italian citizen since birth by jure sanguinis in 2005. He has won several awards, including four Grammy Awards and multiple Juno Awards. His first album reached the top ten in Canada and the UK. He found a worldwide audience with his 2005 album It's Time, and his 2007 album Call Me Irresponsible which reached number one on the Canadian Albums Chart, the UK Albums Chart, the US Billboard 200, the Australian ARIA Albums Chart and several European charts. 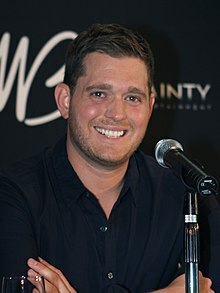 Bublé was born in Burnaby, British Columbia, on 9 September 1975 to Lewis Bublé, a salmon fisherman, and Amber (née Santaga). He has two younger sisters, Brandee, a children's book author, and Crystal, an actress. The siblings were raised in the Roman Catholic faith. He attended Seaforth Elementary School and Cariboo Hill Secondary School. According to an Oprah interview on 9 October 2009, Bublé dreamed of becoming a famous singer from the age of two. When he was a teenager, he slept with his Bible and prayed to become a singer. Bublé's interest in jazz music began around age five when his family played Bing Crosby's White Christmas album at Christmastime. From the age of 14, Bublé spent six years working during the summer as a commercial fisherman with his father and crewmates. Bublé described his work experience as "The most deadly physical work I'll ever know in my lifetime. We’d be gone for two, sometimes three months at a time and the experience of living and working among guys over twice my age taught me a lot about responsibility and what it means to be a man." His first singing engagements were in nightclubs at the age of 16 and were facilitated by his Italian grandfather Demetrio Santagà, a plumber originally from the small town of Preganziol, in the district of Treviso, who offered his plumbing services in exchange for stage time for his grandson. Bublé's grandfather paid for his singing lessons. Both his voice teacher, Sandi Siemens and his maternal grandfather never stopped believing that he would become a star. Bublé's maternal grandmother, Iolanda (née Moscone), was also Italian, from Carrufo, Villa Santa Lucia degli Abruzzi, Italy. His father is also of Italian descent. His original brush with entertainment was as a children's entertainer using the name Mickey Bubbles. Bublé's self-titled debut album was released 11 February 2003 by 143 Records/Reprise Records. The album features a range of standards from various eras including "Fever", "The Way You Look Tonight", "For Once in My Life", "Moondance" and "You'll Never Find Another Love Like Mine". Also on the album is "How Can You Mend a Broken Heart? ", with Barry Gibb of the Bee Gees singing back up vocals. The album went to the top 10 in Canada, United Kingdom, South Africa and reached No. 1 in Australia. It was No. 33 on the ARIA Top 100 Albums of 2003. It achieved marginal success in the United States reaching the top 50 on the Billboard 200. Three tracks from the album ("Kissing a Fool", "How Can You Mend a Broken Heart? ", "Sway") reached the top 30 on the Billboard Hot Adult Contemporary Tracks chart. The album reached No. 1 in Canada, Italy, Japan, and on the Billboard Top Jazz chart, No. 2 in Australia, and No. 7 on the Billboard 200. Additionally it reached the top 10 in the United Kingdom, Switzerland, Norway, Austria, and Sweden. The album spent 104 weeks on the Billboard Top Jazz chart, including a record-breaking 78 weeks in the No. 1 spot. It's Time was Billboard's Top Jazz Album in both 2005 and 2006. The first single, "Feeling Good", met with little commercial success. However, the second single from the album, "Home", reached No. 1 on Billboard Adult Contemporary Tracks chart and No. 72 on the Billboard Hot 100. The third single "Save the Last Dance for Me" reached No. 5 on the Billboard AC Track Chart and No. 99 on the Billboard Hot 100. Possibly known as his claim to fame album. Although some songs in this album featured a covered song ("Feeling Good", first performed by Cy Grant in 1964), Bublé's original track "Home" had a lot of success. To advertise Michael Bublé's Christmas in Hollywood on NBC, he released a Christmas song called The More You Give (The More You'll Have). Bublé's ninth studio album Nobody but Me was released on 21 October 2016. Same-titled lead-single, featuring Black Thought of The Roots, was released on 19 August 2016. Bublé also launched globally in around 30 countries his own women's fragrance on 26 August 2016. Throughout his career, Bublé has been referred to as the "crooner" of the new generation. During an appearance at Australian television's Logie Awards in 2005, Bublé met British actress Emily Blunt and they soon began dating. Blunt provided background vocals on Bublé's song "Me and Mrs. Jones" and the song "Everything" was reportedly penned by Bublé for her. After his relationship with Blunt ended in July 2008, Bublé began dating Argentine actress Luisana Lopilato. Bublé and Lopilato became engaged in November 2009 and married in March 2011 in Buenos Aires. On 27 August 2013, Lopilato gave birth to their son Noah. Their second son, Elias, was born on 22 January 2016. Bublé co-wrote the hit single "Haven't Met You Yet" for Lopilato while they were dating and she appeared in his music video. His son Noah was diagnosed with liver cancer in November 2016. As of March 2017, Noah is "progressing well" with treatments and expected to recover. In June 2016 Bublé underwent surgery on his vocal cords and was required to be silent for two weeks. Bublé is considered to be fully healed from the vocal cord malady and is reportedly in perfect health. ^ "Michael Bublé". Forbes. 2015. Retrieved 28 April 2016. ^ Latham, Aaron. "Michael Bublé Biography". AllMusic.com. Retrieved 6 November 2016. ^ "Italian News - November 26". ^ "Winehouse, West big winners at Grammys as Feist shut out". CBC News. 6 June 2009. Archived from the original on 5 June 2008. Retrieved 20 June 2008. ^ "Neil Young and Michael Buble among Grammy winners". CTV News. The Canadian Press. 31 January 2010. ^ Profile, latimes.com; accessed 10 April 2015. ^ a b "Nightline Playlist: Michael Bublé". ABC News. Retrieved 24 September 2014. ^ Jason Lynch and Stacey Wilson (30 April 2007). "Pop Crooner Michael Bublé". People. Vol. 67,No. 17. ^ a b c d Alan Jackson (28 April 2007). "The youngest singer in town". The Times. London, UK. Retrieved 6 June 2009. ^ "Michael Bublé (Steckbrief)". Warner Music Germany. Retrieved 24 September 2014. ^ a b "Oprah interview video, "Measuring Michael Buble's success"". Oprah.com. Retrieved 24 September 2014. ^ Fekadu, Mesfin. Q&A: Michael Buble talks new CD, love and religion. San Francisco Chronicle, 21 October 2009. ^ Hiltbrand, David. "Croon prince: Canada's young Michael Bublé is an heir to Sinatra Archived 17 January 2011 at the Wayback Machine. ", nctimes.com, 24 March 2004. ^ a b c d e Posner, Michael (22 September 2007). "Michael Bublé wants to take over the world". The Globe and Mail. Toronto. Archived from the original on 26 March 2009. Retrieved 6 June 2009. ^ a b c Bream, Jon (28 March 2010). "He didn't cut it as a hockey player, so Michael Bublé became a pop star". Minneapolis Star Tribune. Retrieved 1 April 2010. He has sold more than 25 million albums worldwide. ^ Armstrong, Denis. "No time like now for Bublé", Jam.canoe.ca; accessed 10 April 2015. ^ a b Pap, Elliott. "New Giants co-owner Bublé 'eats, drinks' hockey", vancouversun.com, 8 December 2008. ^ Gold, Kerry. Michael Bublé's Olympic gig, ctvolympics.ca, 1 February 2010. ^ Canadian Press.Singer Michael Buble named minority owner of Vancouver Giants, SportingNews.com, 11 December 2008. ^ Harvey, Alec. "Crooner Bublé flying high, as is his popularity", Nola.com, 15 July 2006. ^ a b Bierly, Mandi. "Six Things You Should Know About Michael Bublé", ew.com, 4 May 2007. Published in issue No. 933; 11 May 2007. ^ a b "Italian Citizenship for Michael Bublé". Italian Almanac.org. 26 November 2005. ^ a b "Singer Bublé Tours Italy as New Citizen". The Florentine. 1 December 2005. Retrieved 6 June 2009. ^ a b "Da Carrufo ad Ancona per consegnare il quadro a Michael Bublè" (in Italian). Il Tempo. 30 November 2005. ^ Andrea Morandi (24 October 2007). "MICHAEL BUBLE, La voce che sembra Sinatra 'Per me è tutto un sogno'" (in Italian). la Repubblica. p. 11. ^ "Onstage Offstage". google.ca. Retrieved 2 March 2015. ^ "Michael Bublé Biography". Retrieved 24 September 2014. ^ "Bubling along nicely". Archived from the original on 22 February 2012. Retrieved 24 September 2014. ^ "Smooth Operator". sixtyminutes. Retrieved 24 September 2014. ^ Nunez, Mike. Q&A: Michael Buble profile, brevard.metromix.com, 10 March 2010. ^ Abram, Malcolm X. Michael Buble turns on charm, Ohio.com, 17 March 2010. ^ , podcasts.magic.co.uk; accessed 10 April 2015. ^ "Bublé, Michael". The Canadian Pop Encyclopedia. Canoe/Sun Media. Retrieved 11 April 2015. ^ "Genie nominations a surprise: Buble". The Province, 17 December 2000. ^ Greenwich 2000 Limited. "Michael Buble at The O2 arena". Wwp.millennium-dome.com. Retrieved 7 December 2010. ^ "Michael Bublé biography". AskMen.com. Retrieved 9 June 2009. ^ Jeff Bateman. "Encyclopedia of Music in Canada: David Foster". Thecanadianencyclopedia.com. Retrieved 7 December 2010. ^ a b "Michael Buble: I was told my music wouldn't sell". Retrieved 7 December 2016. ^ a b "ARIA Charts – End of Year Charts – Top 100 Albums 2003". Australian Recording Industry Association. 2003. Retrieved 10 June 2009. ^ a b "Michael Buble delivers the old-fashioned goods". CTV News. The Canadian Press. 10 March 2003. Retrieved 16 March 2009. ^ Hay, Carla (30 April 2003). "Ballads, Classics Dominate 'Down With Love'". Billboard. Archived from the original on 5 July 2013. Retrieved 6 June 2009. ^ "Discography – Michael Bublé". AllMusic. Billboard. ^ Bobby D. (12 February 2007). "'It's Time' Celebrates Second Anniversary On Top". The Daily Bublé. Retrieved 6 January 2009. ^ a b "Artist Chart History – Michael Bublé". Billboard. Retrieved 6 June 2009. ^ Howard, Theresa (11 September 2005). "Products are now being placed in other products' ads". USA Today. ^ "The 2007 JUNO Nominations & Winners". Canwest News Service. 1 April 2007. Archived from the original on 10 August 2011. Retrieved 6 June 2009. ^ Hasty, Katie (16 May 2007). "Buble Sidesteps Bone Thugs To Claim No. 1". Billboard. Retrieved 6 June 2009. ^ "Album – Comin' Home Baby". 3 Music Store. Retrieved 6 June 2009. ^ Herrera, Monica (27 August 2009). "Michael Buble To Unleash 'Crazy Love' In October". Billboard. Retrieved 31 August 2009. ^ Bublé, Michael (28 August 2009). "Barbra Streisand's New Album Partners Out Now!". MichaelBuble.com. Retrieved 6 September 2009. ^ "THE HOUR S6: EPISODE 11 - STEVE YZERMAN & MICHAEL BUBLÉ". Retrieved 24 September 2014. ^ "Michael Bublé on Glenn Beck Show". Michaelbuble.com. 22 December 2009. Retrieved 7 December 2010. ^ "Michael Buble Official Site". Michaelbuble.com. Retrieved 7 December 2010. ^ Trust, Gary (20 January 2010). "Chart Beat Wednesday: Tim McGraw, Michael Buble, Owl City". Billboard. ^ Cook, Shannon (15 October 2009). "Michael Bublé's take on love goes to the top". CNN. ^ Mervis, Scott (14 March 2010). "Crooner Michael Bublé considers himself an interpreter". Pittsburgh Post-Gazette. ^ Bierly, Mandi (14 October 2009). "Michael Bublé on 'Crazy Love,' '30 Rock,' and his shower song". Entertainment Weekly. ^ "TODAY joins Olympics action in Vancouver". 4 February 2010. Retrieved 8 February 2010. ^ Staff (8 January 2010). "Michael Bublé shows Australia best of Canada.". Canadian Tourism Commission. ^ "Winter Olympics Closing Ceremony Diary (Live Blog)". The Wall Street Journal. 28 February 2010. Retrieved 1 March 2010. ^ "Olympics Wrap-Up – Michael Bublé – The Colbert Report". Colbertnation.com. 1 March 2010. Retrieved 7 December 2010. ^ 2010 JUNO Awards nominees are announced! Archived 10 March 2010 at the Wayback Machine., 3 March 2010. ^ a b "Michael Bublé Goes Hollywood and Sold- Out Tour Continues". michaelbuble.com. 6 September 2010. Retrieved 8 September 2010. ^ "Sold-Out Canadian Tour Wraps with a Donation to the B.C. Children's Hospital". Michaelbuble.com. 23 August 2010. Retrieved 7 December 2010. ^ "BBC page for the programme". BBC. Retrieved 24 September 2014. ^ "Michael Bublé gets Christmas No. 1 album". Digital Spy. Retrieved 24 September 2014. ^ "Michael Bublé unwraps a 'quintessential' 'Christmas' gift". USATODAY.COM. Retrieved 24 September 2014. ^ "News - Michael Bublé". Michael Bublé Official Website. Retrieved 24 September 2014. ^ . "Michael Buble Scores Fourth No. 1 Album on Billboard 200 Chart" Billboard.com; retrieved 5 February 2013. ^ "TV Picks: 'Michael Bublé's 3rd Annual Christmas Special'". The Seattle Times. 18 December 2013. Retrieved 9 September 2014. ^ "Michael Bublé with attitude". Toronto Star, 24 October 2016. by Ben Rayner. ^ "Eau de Buble: Vancouver singer Michael Buble preps new fragrance". The Vancouver Sun. 9 August 2016. Retrieved 19 August 2016. ^ "In the mood for jazz joy". North Shore News. 16 November 1998. Archived from the original on 8 November 2005. ^ Armstrong, Denis (1 February 2001). "Swinging to great heights". Ottawa Sun. ^ a b Adams, Cameron (28 April 2005). "Cameron Adams discovers singer Michael Bublé really enjoys bad reviews". Herald Sun. Newstext.com.au subscription required. p. 3. ^ MacQueen, Ken (4 February 2005). "Break Out the Bublé". Maclean's. ^ a b Adams, Cameron (3 May 2007). "Bublé rapt". Herald Sun. ^ Perusse, Bernard (30 April 2007). "Michael Bublé does it his way". Edmonton Journal. Archived from the original on 26 February 2008. ^ "Michael Bublé gets irresponsible". The Daily Telegraph. 10 May 2007. Retrieved 10 April 2015. ^ Daly, Susan (6 March 2009). "Emily Blunt: Naughty but nice". The Irish Independent. Retrieved 10 April 2015. ^ Kristen Mascia (11 July 2008). "Emily Blunt and Michael Bublé Split". People. Retrieved 11 July 2008. ^ a b NewsCore. "Michael Bublé to wed Argentinian soap star Luisana Loreley Lopilato de la Torre", News.com.au, 11 January 2010. ^ Cottrill, Jeffrey (11 January 2010). "He's no longer lost: Canadian singer Michael Bublé engaged to Argentine actor-singer". Divorce Magazine.com. ^ Jackson, Bart (31 March 2011). "Michael Bublé marries Argentine sweetheart in Buenos Aires". The Vancouver Sun. Archived from the original on 10 August 2011. Retrieved 31 March 2011. ^ "Michael Buble, wife welcome baby son Noah". CTV News. Retrieved 10 April 2015. ^ "Michael Bublé Welcomes Son Elias". celebritybabies.people.com. Retrieved 30 October 2016. ^ Horton, Shelly (2 November 2009). "Call him irresistible". The Age. Melbourne. Retrieved 10 April 2015. ^ "Michael Buble reveals 3-year-old son's cancer diagnosis". Fox News. 4 November 2016. Retrieved 4 November 2016. ^ "Michael Buble's House". Virtual Globetrotting. Retrieved 24 September 2014. ^ Francis, Eric. "Reynolds' last run in city? ", calgarysun.com, 23 November 2009. ^ Johnson, Glenn. "Michael Bublé: If you want me to sing, give me a puck", vancouversun.com, 17 November 2009. ^ "Vancouver Giants Team Owners". Retrieved 24 September 2014. ^ "Australia's Hollywood stars dig deep for fire relief". ABS-CBN News. Agence France-Presse. 13 February 2009. Retrieved 31 August 2009. ^ "Michael Buble with His Believe in Magic Wristband!". Retrieved 30 October 2016. ^ "Update On Michael's Vocal Chord Surgery". .michaelbuble.com. Retrieved 30 October 2016. ^ "Michael Buble's Christmas in New York". NBC. Retrieved 24 December 2014. ^ "The nominees for the 2009 JUNO Awards are...". National Post. 3 February 2009. Retrieved 29 March 2009. ^ "World Music Awards 2005". Popstarsplus.com. Retrieved 7 December 2010. ^ "Jazz-Produktion des Jahres national/international". ECHO 2006: 12.03.2006, Estrel Convention Center Berlin (in German). ECHO 2006 Deutscher Musikpreis – die offizielle. 12 March 2006. Retrieved 26 June 2008. ^ "Buble comes out on top at Canadian jazz awards". CBC News. 8 March 2008. Retrieved 3 January 2009. ^ "Photo Galleries Michael Buble, Nettwerk founder among B.C. Hall of Fame inductees". CBC News. 11 March 2009. Retrieved 2 July 2015. ^ "Meteor Music Awards: Winners (Fully Updated)". GoldenPlec.com. 19 February 2010.